Torresol Energy has announced the commissioning of its Gemasolar CSP electrical plant. It went on-line 5/24/2011, with a maximum output of 19.9 MW, and 15 hours of thermal energy storage, which allows it generate power 24 hours per day many months per year. The plant (formerly called Solar Tres when the business partners were different), is located near Seville, Spain (the Andalucía region). The annual electrical output of 110 MWh/year equates to a capacity factor of 63.1%. This is the highest value of any production solar plant in the world. This is not quite baseload, but it would need half the fossil fuel backup of PV technology. It would also have one third of the transmission cost of PV (making the best solar choice for projects like http://www.desertec.org/ ). The secret of the high capacity factor is the sunny location (expected 270 productive days/year), and a solar field that is so over-sized that significant summer collection is discard in order to get more operating hours during the rest of the year. Gemasolar is the first commercial central tower plant equipped with a molten nitrate salt thermal energy storage system, first demonstrated by the US DOE at the Solar Two plant in Barstow California in 1998 (ignoring the very small French Themis experiment). The Spanish engineering company SENER (part owner of Torresol) has apparently developed their own molten salt technology since Boeing/Rocketdyne (which built the Solar Two receiver) left the project. 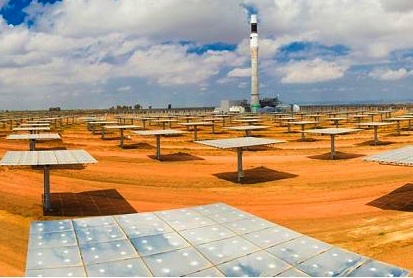 In related work, Solar Reserve ( http://www.solarreserve.com ) is working on a central tower plants in Blythe California and Crescent Dunes Nevada, which would utilize molten salt storage, and Brightsource ( http://www.brightsourceenergy.com ) is working on a central tower plant in Ivanpah California that would skip the storage and use simpler direct steam generation. Thank Nathan for the Post! Willem, the 50 MW size limit comes from the requirements of the Spanish feed-in tariff, and is smaller than is necessary for minimum cost (according to the US DOE NREL). NREL also claims that central tower design should be cheaper than trough designs; provided the bugs can be worked out (they allow higher temperatures, which boost turbine efficiency, and reduce the amount of salt needed for heat storage). The cost target for minimal commercial success though is not grid parity, but parity with PV. There are several target markets (Germany, Spain, and California) which have already shown themselves willing to buy GigaWatt quantities of very expensive electricity. Because of the superior capacity factor possible with thermal energy storage, any grid can accommodate more clean energy with desert CSP than it can with PV or wind. Perhaps “capacity factor” is not such an important issue as matching demand. The phase change storage heat sink, and over-sized solar collection area liberates the system from a fixed set of numbers. A car that runs as baseload perfect capacity factor isn’t desirable. Why do we not want flexibility in a good many of our electric power generating systems? Sure demand matching is the goal. But electrical demand usually stays between +-20% of the average, so the capacity factor for variable renewables is a good first estimate of the percentage of the time that it can supply the demand (if scaled up suitably). Also, capacity factor can be calculated from annual output, a frequently provided value. This estimate is a little optimistic for wind, since wind usually is anti-correleated with load. It’s a little pessimistic for solar with no storage or baseloaded (run at exactly 100% all-day, every sunny day), since the load is correlated. With storage that is dispatched to match demand (i.e few hours), capacity factor does not provide enough info. Even with 15 or more hours of storage, there will be cloudy periods that require a backup system. The percentage of annual output that comes from backup is very important, seldom stated, and larger than most renewable advocates like to admit. Yes, Torresol does seem to be inconsistant in their reporting. The old NREL SL-5641 (NREL/SR-550-34440 from 2003) report says that a plant this size will have about 15% of its gross output used by “parasitic” loads (pumps, fans, building lights and other equipement). So a 19.9MW gross turbine output and 17 MW net plant output would be consistant with that. There is absolutely no question: consumer will not fund a predomantly solar electrical grid at today’s solar prices. The question is will we a) build a clean energy portfolio using today’s affordable technology: wind, geothermal, and nuclear; or b) keep burning fossil fuel until the price of solar power with storage meets our target price. There is no end in site to the improvements in solar. Continued improvements mean lower costs and improved efficiency means greater output per space used for installation.These lower costs means that solar will continue to spread into states..
Great to see another state join the solar club. Let's see if Wisconsin can keep up with its neighbors Minnesota and Illinois in implementing new solar.Wisconsin utility regulators on Thursday approved a series of solar-energy proposals that..
How Solar Is Your State? Solar power is fast becoming one of the most accessible alternative energy sources, now that non-renewables are declining. In fact, The U.S. is second in the world only after China with regard to total cumulative installed capacity, and that..